Dole Packaged Foods is focused on the foodservice side of the Dole fruit company. They have a different focus than the consumer facing company, but still share the same name. 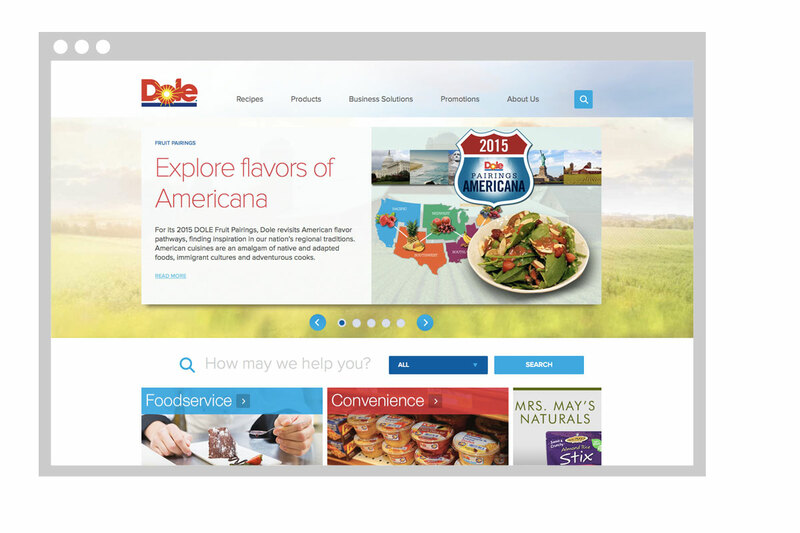 I helped to coordinate a redesign of Dolefoodservice.com that was similar to the recent Dole.com update, but sensitive to Dole Packaged Foods’ specific needs. The main website is a repository of information regarding Dole Packaged Foods’ products and serves as a tool for both foodservice operators and Dole’s sales brokers. I worked to develop specialized pages within the site that presented relevant information to the various foodservice industries, introduced new products and highlighted Dole’s yearly “Fruit Pairings” which forecast fruit-centric recipes for each year. © 2019 Kyle Strash Design. All rights reserved.